Foothill Communities Association, (FCA) represents the unincorporated area of North Tustin, which is genenerally considered to encompass the communities of Lemon Heights, Redhill, Cowan Heights and Panorama Heights and other neighborhoods. With about 10,000 homes in the Foothill Communities, the FCA, according to its mission, has strived since the 1960s to preserve its highly valued living environment. Concerned about the expanding impact of John Wayne Airport, the FCA Aviation Committee is studying ways to mitigate the effects of the arrival planes on their homes. Last year, FCA became a supporter of AirFair. Click on the Association's website, read the first page and find out how JWA affects this important part of Orange County, a community which could lose its excellent quality of life because of JWA. Many residents have expressed concern about increased air traffic, noise, and potential pollution from aircraft. An Airport subcommittee has been formed to determine if and how FCA should address JWA impacts on North Tustin. If you would like to participate, contact Committee Chair Hal Marshall. Be sure to complete the form below and include your name on the form for validation. Since the end of last year, residents in Cowan Heights, Lemon Heights, and other areas of North Tustin have noticed a significant increase in the number of commercial and private jets overflying their homes. On some days, this can number up to a third of all approach flights into the airport, over an area that experienced very few flights in the past. There has also been an increase of flights over North Tustin headed to Long Beach airport as well. This change in flight patterns is due, in part, to the FAA opening up the air space once reserved for the former El Toro and Tustin Marine bases. As a result, many aircraft that in the past approached the airport west of Easter Hill are now allowed to approach east of the hill, putting them right over Cowan and Lemon Heights. FAA regulations dictate how pilots are to approach JWA. During overcast conditions or periods of low visibility, pilots must intercept the Instrument Landing System (ILS), a radio guidance system, at a distance approximately seven to ten miles from the airport, which means they must fly west of Easter Hill, away from Cowan and Lemon Heights. However, in clear weather, pilots have the discretion to intercept the ILS at a point much closer to the airport, thus allowing them to cut across the foothills to line up with the guidance system. Also, there is no minimum altitude at which they must operate over the foothills, as long as they fly the aircraft in a safe manner. These changes in approach patterns do not bode well for the residents of the foothill communities. Some residents have expressed their feeling that the increase in flights already has had a serious impact on the environment and has altered the rural character of the region. There is a possibility that property values could begin to suffer as well. If we do not respond in some way, JWA will inevitably continue to grow; even today, there are forces actively working to further increase the size of the airport. Those forces include: (1) an increasing OC population, which is inevitably causing increasing demand for John Wayne services; (2) groups which are actively campaigning to promote future growth at JWA. At the March 2008, annual meeting of the Foothill Communities Association (FCA), attendees concerned with aircraft noise were invited by the Mr. Alan Murphy, Director of John Wayne Airport (JWA), to visit the Airport facilities. The purpose of the visit was to hear a briefing by the JWA staff describing their activities to monitor and regulate aircraft operations that affect noise due to aircraft arriving and departing the airport. On May 5, 6 and 13, 2008, a total of 40 concerned residents from North Tustin and neighboring cities attended these briefings. 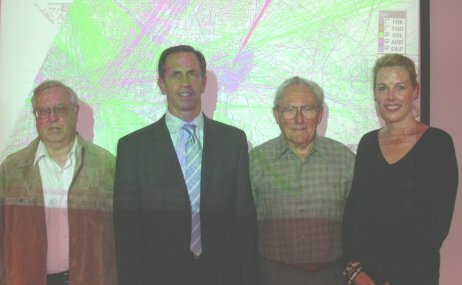 In the image to the left Richard Nelson, Eric Freed, Hal Marshall, and Sarah Demont (left to right) stand in front of radar track maps showing aircraft approaching JWA. Mr. Eric Freed, Manager of Access and Noise, discussed the roles and responsibilities of his staff in implementing the County policies and regulations controlling aircraft noise, noting that JWA is one of the most regulated and restrictive airports in the nation. These restrictions include maximum noise levels, the number of noise regulated departures, the number of passengers allowed to travel through the airport annually, and a night time curfew. These restrictions are a result of the 1985 and 2003 Settlement Agreements entered in to by the County of Orange, the city of Newport Beach and two citizen organizations, and may expire in 2015 unless a further agreement is reached. These regulations do little to control aircraft noise over the North Tustin & Tustin, except during night time curfew hours of 11:00 PM and 7:00 AM. To be specific, the Federal Aviation Administration (FAA) and the pilot in command of an aircraft have exclusive control over flight paths and altitudes. As a consequence, most efforts to reduce aircraft noise over North Tustin and corridor cities must be directed to the FAA and the airlines. The FCA Airport Committee has been studying the issues and is in the process of acquiring the technical information needed to discuss our concerns with the FAA. There are new capabilities in aircraft navigation equipment and procedures that have the potential to reduce noise in our neighborhoods, if approved by the FAA and implemented by the airlines. The Committee plans to explore alliances with neighboring cities concerned with aircraft noise and pollution. The JWA staff has indicated they are fully supportive of FCA efforts to address airspace and navigational issues affecting aircraft noise and will facilitate discussions with the FAA and airlines. Residents of the North Tustin area, the city of Tustin and neighboring communities concerned with these airport issues are welcome to participate in the FCA airport initiatives. Please contact AirportGroup@FCAhome.org, see the button at the top of this webpage to join a committee, and be sure to inform your neighbors that FCA is trying to make a difference. Posted below are both sides of a tri-fold brochure Foothill Communities Association distributes to its neighborhoods. Many of the residents of the Foothill Communities live under the JWA arrival flight path. An advisory committee would address residents' concerns of noise, environmental pollution and a decrease in home values. More than 200 North Tustin residents gathered Monday evening at Hewes Middle School to discuss moving forward with a John Wayne Airport advisory committee that would address residents' concerns and complaints with the airport. The discussion was part of the Foothill Communities Association's annual community meeting to focus on issues concerning North Tustin residents. An ongoing survey conducted by the association revealed that 50 percent of more than 400 responses believed the airport has a negative impact on the community, with noise, environmental pollution and reduction in home values listed as the top three concerns. Airport Director Alan Murphy told the audience that 2008 should see a decrease of three flight arrivals and departures from an average of 125 arrivals and departures a day in 2007. Murphy confirmed that airlines are fined for violating the airport's curfew rule, which prohibits arrivals and departures before 7 a.m. and departures after 10 p.m. No arrivals are allowed after 11 p.m.
"We heavily fine any airlines that violate that," Murphy said. "That's just unacceptable behavior." Private jets are exempt from the curfew rule because they are regulated by noise levels according to federal law, Murphy said. Many residents expressed concerns over a perceived change in planes' flight patterns after the closure of the former Marine helicopter base in Tustin. "It really does seem like the flight paths have changed; I'm concerned that flights will increase," North Tustin resident Mary Nesbitt said. "We just don't want to see it grow anymore because we're afraid it's going to get worse." Murphy said the change in flight patterns is a misconception and that patterns have remained the same since 1965 when the Foothill Communities Association was formed. Tustin is so close to the airport that planes have to be on path to land before they fly over Tustin, Murphy said. However, he added, flight patterns are not controlled by the airport but rather by the Federal Aviation Administration. Supervisor Bill Campbell said he would encourage an airport advisory committee formed by the residents. Richard Nelson, president of the Foothill Communities Association, said he is excited to see a more active airport committee form after Tuesday's meeting. "People are concerned about the noise and the potential future expansion," he said. "Nobody wants to see it become another LAX." While no course of action has been decided, the airport advisory committee hopes to become a liaison between the community and the airport. The goal of the committee, Nelson said, is to make the airport's evolution compatible with the community's concerns. The committee hopes to work in conjunction with the airport, county and the FAA to address these concerns. "It's encouraging that we're going to set a committee together," Nesbitt said. "We're not just going to sit back; we're getting involved." For more information on the Foothill Communities Association, visit www.fcahome.org.